Figure 1: Some transformers for electronic devices with different dimensions, outputs and shapes. Formulas keepin in account shape, core size, the number of windings, the cable section. In contrast with all these methods, the procedure presented in this article is based on the measure of the transformer output voltage while it's turned on, with or without load. The main advantage is to measure directly the electrical quantities directly involved in the determination of the output power, allowing thus to obtain a good precision. The basic idea is the following: the transformer is supplying the maximum power when its output voltage, loaded, is between the 80% and the 90% of its no-load voltage. The exact percentage n is an empirical parameter, and changes according to models, but it's anyway possible to obtain good results. Figure 2: The connection diagram for the measurement of the transformer. A plug in order to connect the transformer to the power grid. n is an empirical value comprised between 0.8 and 0.9, typically 0.85. It is possible to repeat the measure with many load resistors, in order to be able to plot the current-voltage plot to verify the precision of the measurement. 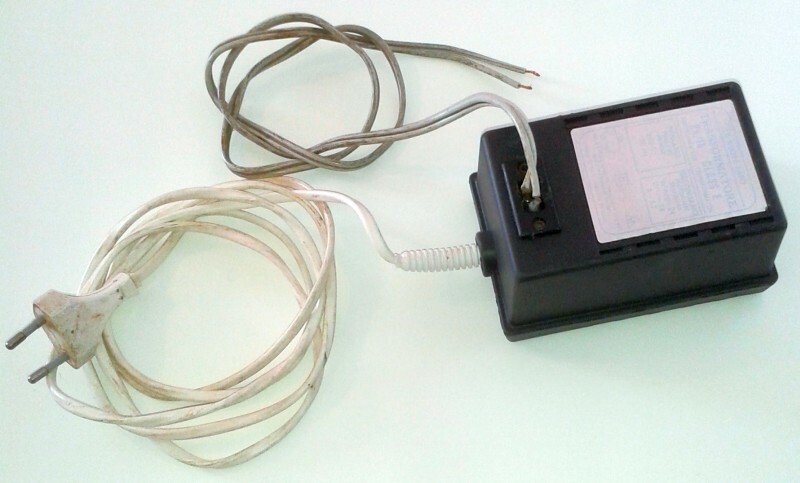 The choice of the load resistor is important for the measurement. In theory, every value can be used. In practice, due to the limited multimeter resolution, it's better to choose a low resistance, for example 10 Ω or 100 Ω, in order to produce a high voltage drop at the transformer output. In this way the measure uncertainties are reduced. In practical situations, resistors with lower powers can be used, provided that they are connected only for a few seconds; being indeed undersized, their overheating causes first a shift in their resistance value, and then their breaking. If adequate power resistors are missing, series or parallel resistors can be used, in order to distribute the total power. An example is shown in Figure 3. Figure 3: A possible configuration to combine resistors with the same values in series and parallel in order to obtain an equivalent circuit with the same resistance but higher dissipated power. 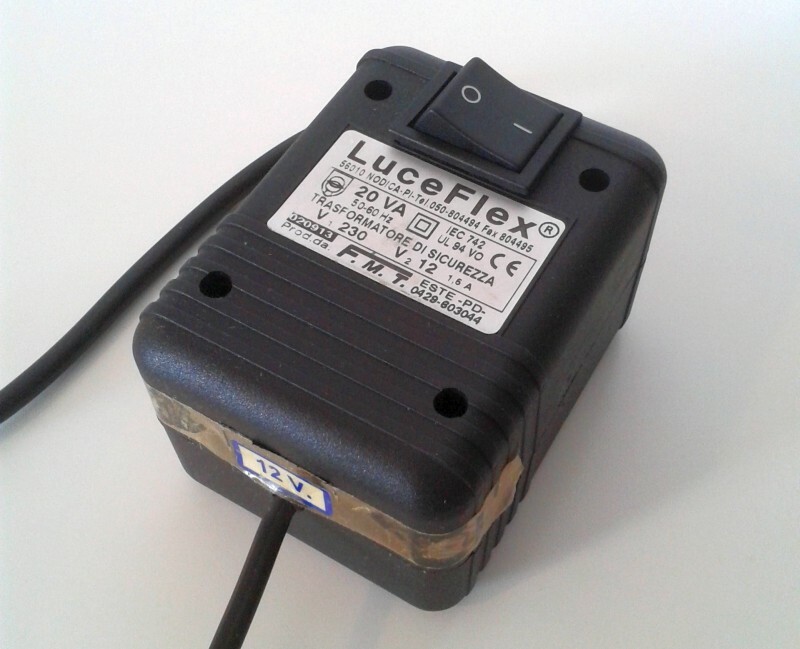 Once the voltage on the load Rout has been measured, it's possible to compute the supplied current with the Ohm law. 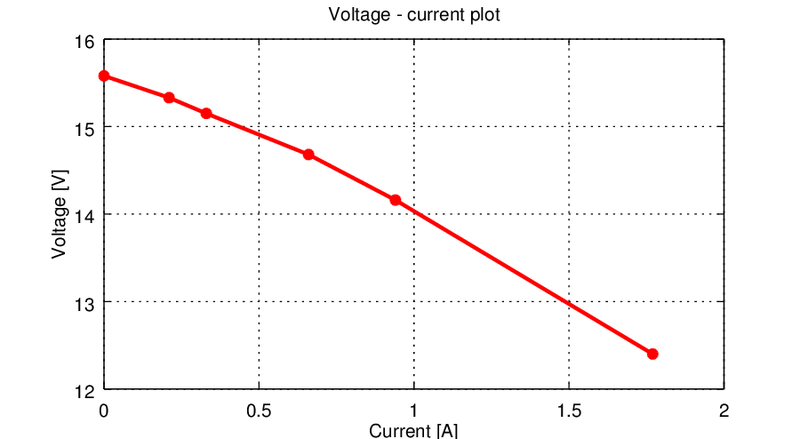 If more measurements with various Rout values are performed, a voltage-current curve can be plotted, in order to verify the precision of the measurement. In case of a correct estimation, the plot is a line, which confirms the transformer ohmic behaviour when it is not supplying too much power. If the load resistor Rout is too small, that is if the power supplied by the transformer is very high, various physical phenomena would take place, such as the core saturation, which would make the transformer behaviour no longer linear; this would result in a voltage-current curve no longer straight. Moreover, in case there's an error in the measurement (wrong Rout or Vout values) the curve helps to find it. 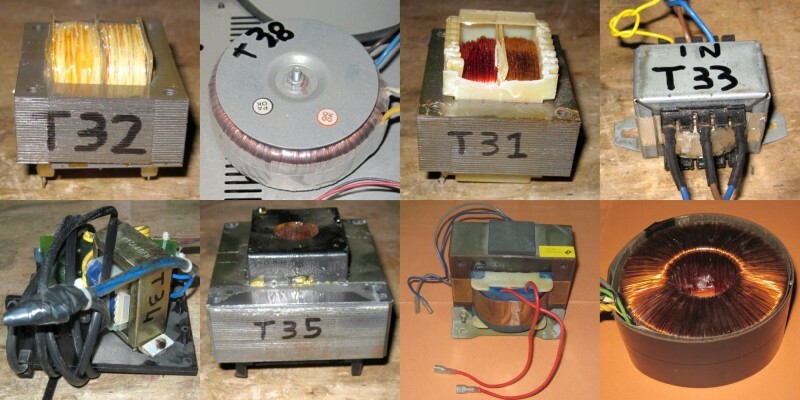 The Table 1 shows various measurements performed on the transformer with various load resistors. Only one would be enough to compute the maximum power with the Formule 1, but in this way it's possible to plot the graph in Figure 5 to test that the transformer has basically an ohmic behaviour. From the values obtained in the table it's possible to determine that the best estimation is for n=0.9, that is when the output voltage is the 90% of the no-load one. 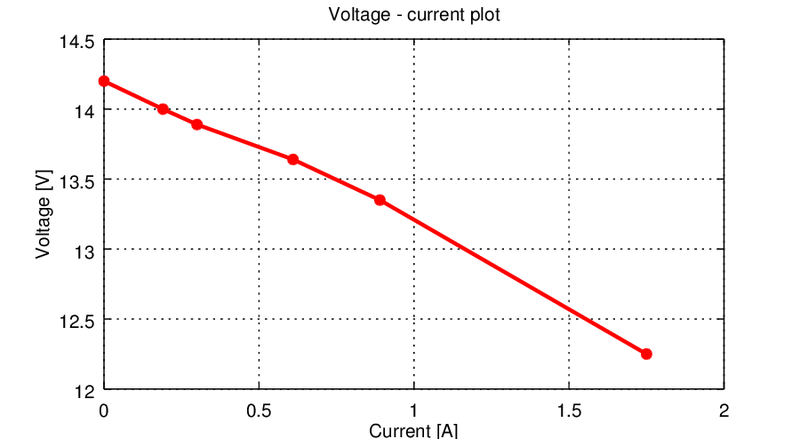 Figure 5: The transformer voltage-current plot, obtained through multiple measures with different load resistors. It's a straight line, and this confirms the linear behaviour, that is ohmic behaviour, of the transformer. As in case of the first example, the Table 2 resumes the measurement results, plotted in the graph of Figure 5. In this case the best estimation is for a factor n=0.8, that is where the output voltage is the 80% of the no-load one. 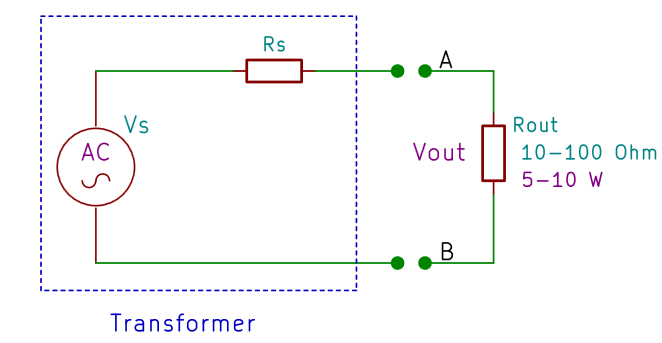 Figure 6: The transformer 2 used in this example. Figure 7: As in case of transformer 1, the voltage - current plot confirms the linear and ohmic behaviour of this device. In this section the origin of the formula used to compute the maximum transformer power is shown. There are many equivalent circuits for a transformer output port; among the most simple ones, the one that simplifies it to common generator with a series internal resistor, as shown in Figure 8. Figure 8: The transformer Thevenin equivalent circuit.